The operation to remove the grounded vessel Hephaestus from Qawra commenced on Monday. The wreck-removal-plan and environmental permit were recently approved and the work is expected to take around 35 days. 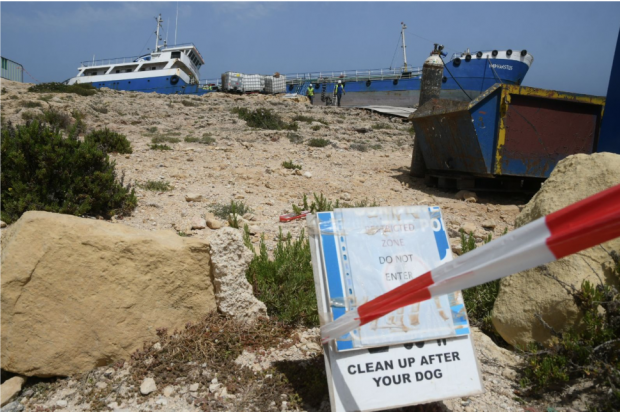 The P&I Club as insurers had, on behalf of the owners of the vessel, issued a call for quotations to several potential contractors, to commission the removal. Local contractors Cassar Ship Repair (CSR) were awarded the contract and have already started mobilising equipment. Personnel were on Monday loading up the vessel after it was ascertained safe. Once inside, personnel will clean all the compartments and close off all the breaches in the hull. With the help of specialised equipment, CSR will lift the vessel from the rocks and lower it back into the water. Once afloat, the wreck will be towed to the contractor’s ship repair facility in Marsa. Transport Malta and ERA will be monitoring the operation throughout. The vessel Hephaestus, a 60-metre tanker registered in Togo, had grounded in Qawra, during a storm on February 10 and has become an Instagram sensation since then. The crew returned to shore safely after abandoning the cargo-less vessel.